Razor A5 lux kick scooter is in demand scooter in the market. It is one of the if not the most popular scooters out in the field. Its made by Razor is which is again the most popular scooter manufacturing company in the industry. Razor A5 scooter is geared towards adults and teens. The scooter is a fantastic option if you are looking to save your bus money and some physical exercise. The scooter offers a super smooth ride even on rough surfaces with the help of its big wheels. Its made of top grade Aluminium material which is both durable and lightweight. The weigh capacity is over 220 pounds which is more than enough for most adults. The scooter features larger urethane wheels. The 200 mm wheels allow you to ride smoothly over cracks and gaps. This is especially great if you live in a neighbourhood with rough roads. Razor products have been known to be top quality with affordable price. This one is no different. A5 model is made from superior quality aluminium aircraft grade material which is both durable and lightweight. The scooter is quite lightweight and yet can support a ton of weight without slowing down the ride. The handlebar in this scooter is taller and wider than other models to suits the needs of taller individuals. The handlebar is also adjustable so the scooter can be used by individuals of all heights. The scooter grip is comfortable. The scooter uses a patented folding system that lets you fold it quickly and store it in your place when not in use. Its super lightweight and easy to carry around on your bag as well. The scooter is ready to go out of the box. The only thing you need to do is adjust the handlebars according to your height and you are ready to take it out for a quick spin. The scooter is available under 100$. The pricing is extremely affordable. The scooter easily offers the best bang for your buck. In short, when investing in this scooter, you are investing a high-quality product with stunning looks. In short, you cannot go wrong with Razor A5 lux scooter. Are you looking for a quality scooter? Look no further, Fuzion X3 scooter is undoubtedly one of the finest scooter available in the market. The scooter is poplar amongst the riders for a reason. It is made by keeping beginners in mind. It's an amazing scooter that is matched with affordable pricing. A rare combination no doubt. The scooter is packed with premium features that can only be found in higher end scooters. Its an entry level scooter to help beginners build their skill and advance to next level. Makes it easy to learn stunts for beginners. Available in 6 different colors to choose from including a gold. The scooter is ready to go as it just takes a few minutes to assemble two pieces. The instruction manual is easy to understand and follow even for first-timers. Its dialed and ready to go out of the box. The scooter is super lightweight as it only weights 8 pounds. The deck is made of premium aluminium lightweight material which helps it keeping the weight low for the scooter. Being lightweight also makes it easy to control for beginners. The scooter yet lightweight, can support a ton of weight without any problem. Fuzion x3 scooter is a tough scooter to crack. The deck of the scooter is made of heavy-duty aluminium material which can withstand even the toughest of fall with only a few scratches. The scooter is visually stunning. You can easily expect to get aot of attention when you take this out for a spin. The gold color definitely will make you stand out from the rest. The desing on the deck will stay appealing even after using the scooter for years. The PU wheels are well placed and keeps the ride noise free and smooth. Fuzion x3 scooter features Nylon/Steel custom brake which is both silent and durable. The aluminum deck is perfect for beginners to learn tricks and stunts. Having not enough space to keep your feet is number one concern for any beginner or even experienced riders. The 4 inch box-shaped concave deck has more than enough room for the rider to position his feet comfortably. Apart from being spacious, the aluminium deck is also ideal for performing tricks and tail-whips. The Pro rise handle bar is wide and has strength. It also makes the scooter much easier to control. The grip is comfortable as well. The fuzion pro scooter has been made by Fuzion brand which are one of the best in the industry. All of their products offer great value along with quality. Their support is quick to reply to any problems. when buying from fuzion, you are also backed by a solid warranty that keeps the customer risk free. Fuzion x-3 provides great bang for your buck. In short, It's a versatile high quality scooter that offers a smooth and silent ride for beginner riders. The scooter is visually appealing and comes in 5 different colors to choose from. The build quality is top notch and keeps the scooter running for years without any issues. Definetly worth buying if you are starting out and are passionate about stunts and tricks. Are you looking for a quality pottery kit for your kid? Pottery has been proven to boost your kid confidence. Also the pottery wheel is not limited to making just clay pots. You can also make necklace, ornaments and beds. Ultimately, you are only limited by your own imagination. With the amount of options available in the market, it can be confusing to choose the best for your little one. Faber Castell Pottery is a complete wheel kit for kids and beginners. From wheel to clay and other necessary things , this kit includes all so you dont have to buy separately and can get started as soon as you get hands on this kit. Only thing that you need is batteries which are not included. For parents, it is very important that any toy that they give their kids is 100% safe. The clay that comes with the kit is synthetic which contains less bacteria and microbes than organic clay. Its kid friendly and provides an enjoyable experience. Other than that, the kit also include instructions and tutorials that are easy to follow even for small children and beginners. It is a perfect first pottery kit for any beginner or kids. The kit is somewhat noise when in use, but what toys aren't? Just make sure you do not use it when you watch a movie. Non toxic and child-friendly synthetic clay. Faber Caste pottery kit is super fun and safe. The kit is also quite affordable. Grab it fast as you can. Mindware pottery wheel is a great way to encourage the crafty and creative side fo your kid. Young clay enthusiasts can use this kit to make creative clay objects. Dont worry if your kid left handed, the wheel has a switch on the side to let artist choose the settings for both handed artists. The instructions that come with the kit are extremely detailed and leaves nothing to guess. They are filled with practical and information and images that even kids can follow and learn by themselves. After your kid has finished, there are also decorative materials in the kit that helps them enhances its beauty more. The pottery kit has been made by keeping beginners in mind. It also consists of a lot beginner-friendly features such as safety stop features that prevents your motor from overheating. Apart from this, the wheel is also more durable and well built than most general pottery wheels in the market. The 12 paints included in the kit also keeps it fresh and new. The kit has everything you need to get started with pottery. It's a fine kit that helps your kid get started and master the art. As the name suggests, Cool maker potter studio is the coolest looking pottery studio in the market. The kit includes everything you need to get your kid start sculpting beautiful designs. The kit has 6 different projects to choose from so that your kid never gets bored like jewelry Holder, Smart Phone Speaker, Pencil Holder and more. The kit also consists of 10 metallics colors for your kid to get even more creative with their clay. The tools are high quality and wont break anytime soon. They re also easy to clean. The top down approach also helps kids and even beginners to start with pottering. The wheel needs 4c batteries to work which is not included in the kit. Cool maker is inexpensive quality pottery kit that every kid will love. The tools give more than enough variety for kids to experiment new things. The kit offers unique experience to kids and beginners alike. Pottery kit by Cra-Z-Art is an affordable and budget option. If you are on a shoe string budget and still want a pottery kit that does a decent job, this is the one you should go for. The wheel is battery operated leaving your hands free for sculpting. The toolset that comes with is also surprisingly high quality and durable. However great the kit is, it is not silent as you want it to be. Although for this price point, you cannot complain about it. Also the kit lacks a proper instruction guide to set it up and use. But this is not a problem as there are plenty of youtube tutorials available on this topic. Overall, this is a perfect starter kit to get for your kid. Simply put, the kit does is job really really well. It also provide best bang for your buck. It's cute and colourful pottery kit that is perfect for kids. If you are a kid who has some experience or is looking for something more serious, you should consider this kit. It is a heavy duty potter wheel that is capable for more than building basic sculptures. The kit is great at making larger and more serious projects. The kit helps your kid to use his creative with no limitations. The top and base of the wheel is made by heavy cast metal joined by heavy duty ball bearrings makes this extremely durable and stable. The bearrings also lets the wheels rotate smooth and silently. The concentric circle on the top allows kids to easy center their work. The feature is especially helpful for beginners. Surprisingly, the wheel only weighs around 10 lb which lightweight. Its light enough for you to move when necessary but not enough to travel with it. Concentric circle makes easy to center your work. The kit is great for projects that take a lot of time to complete as its extremely stable and durable. Pottery is a safe and enjoyable way for kids to spend their time away from their phones. It keeps them busy and helps them be more creative and imaginative. It also builds their confidence when they succeed in making their projects. Now that we have been through the best pottery wheels market lets see what factors you should pay attention when making a purchasing decision. Buying a from well known is always a good idea, to begin with. You have almost assured a quality product which is backed by a solid guarantee. Never opt for cheap brands as they don't last long. Safety is number one priority for any parent. Always make sure that the clay that comes with the kit is non-toxic and follow standard guidelines. The wheel should be stable enough to handle projects. However, if you are trying to build larger projects that require a lot of time then should you should consider more heavy duty wheel. The tools should be durable and not break. After this guide, you are more than armed enough with enough knowledge to find a suitable pottery kit for your kid. Also never forget to check reviews by users online. You can also go to niche specific forums and see what other people are getting for their kids. You can always ran out of clay if your kid uses them too soon. Pogo stick has been around for centuries. They're as fun as they ever were. They're one of the few toys that have lasted for so long and can never be replaced by digital medium. The pogo stick is the perfect combination of fun and exercise. Kids love jumping and nothing will make them happier than a visually stunning toy that will allow them to jump even higher. Pogo stick gives your kid fun and joyful experience that will remember even in their adult life. Below we dive in the detailed buying guide, let's see some of the best pogo sticks in the market. Here are some of the best pogo sticks available in the market. This pogo stick has been made by Flybar that has been in the business for a complete century. Its a great entry level pogo stick for your children to get the basics right. The flybar pogo stick is as safe as pogo stick can get. The nonslip slip foot pegs of the stick keep your kid safe from falling and injuring. The entire stick is wrapped in high-quality foam material to keep your kid as comfortable as possible. Along with stick, the handlebar is also covered with foam for extra comfort and security. The pogo stick offers heavy duty spring that will last for years before you need to replace. On top of all these great features, the stick is amazing to look at. You can expect to get a lot of attention when you take it with you to the park. The stick is available in seven unique attractive colors for your kid to choose from. The stick is designed for kids ages of 5-10. Its a perfect pogo stick to gift your kids this holiday season. The stick is aimed for younger enthusiasts. Apart from stunning looks, the stick also offers fun and safe way to burn calories. This pogo stick is made by a thinkGizmos company which has 20 years of experience in the industry. The stick offers a latest aero design which delivers even better stability and comfort. The stick is blessed with stunning and unique looks that will make your kid stand out in the park. Other features include ant-slip footpad which keeps your kid safe and slip free. The foot pad is really easy to replace as well incase if looses the grip. The foam handles are comfortable and enhances the overall experience of the stick. The stick is available in a wide variety of colors to meet your kids style needs. The low construction spring keeps the stick bouncy and fun. The stick also features low friction steel which keeps the bouncing smooth and noise free. All in all, Thinkgizmo pogo stick provides kids a memorable and joy filled experience that they will cherish forever. The stick is relatively affordable and does its job well. Your kid will fall in love with its bright and colorful looks. Definitely worth buying. Available in 8 different color combination, this pogo stick is lovely addition to your kids toys. The handle grip on the stick is padded to keep your kid comfortable while bouncing. It's definitely useful when bouncing for a long period of time on the stick. It also makes it easy to hold onto when bouncing high. The frame of the stick is covered in foam which also keeps the stick durable. Dont worry, if your kid doesn't like the color, there are plenty of other choices to choose from. For the quality you get with this stick, the price is incredibly low. New bounce is a fantastic pogo stick that offers a safe and fun experience for small children. Also the stick is beatutifull to look at as well. Grab this stick as fast as you can. Foam master pogo stick is another fantastic addition to this list. Designed for ages 9 and up, this stick does not disappoint. The stick is very trick and beginner friendly for any kid. Your kid can learn to perform tricks and stunts pretty quickly with this stick. It offers high-quality spring which is completely covered in foam to keep your kid safe and secure. Talking about safety, the stick comes with no slip pads for extra protection. The weigh capacity of the stick is surpassing high. It can be used for both healthy kids and young adults. If you plan to buy pogo stick for both your kid and an older kid or even yourself this is the one you should consider. In case, if your kid is under 80 lbs he wont be able to enjoy it full potential. It is very important that you check your kids weight before buying. Foam Master pogo stick is easily one of the best sticks in the market. The stick jumps and high allows your kid to perform tricks easily. Fisher price is pogo stick for bother beginners and experts alike. You dont have to spend more on an advanced stick after your kid has mastered the basics. This stick practically grows with your child. The beginner friendly features include an extra large base to secure strong footing as well comfort. The base can be removed once your kid bounces like a pro. The grip handles are perfectly sized for kids tiny hands. Other than this, the stick also has extra wide foot pedals which makes it incredibly easy for kids to stay on stick and bounce. The pogo stick is one of the finest stick available in the market. Packed with beginner-friendly features, this stick is perfect for small children. Harmless fun and safe to enjoy can turn into an ugly mess if your stick is not well built. It is crucial that you choose the best pogo stick that suits your kids needs the best. Every pogo stick has different weight capacity. It is very important that you check your kids weight first and then look for pogo sticks. Your child won't be able to bounce properly if his weight is not enough for the stick. Similarly, if the weight is over the capacity, the pogo stick will break and not bounce properly. If you plan to buy a stick for both adults and kids, find a stick that high weight capacity. Just like weight capacity, it is also quite important to check to recommend age for the stick. It's usually written in product specifications. If your kid older or younger than recommended, he won't find the stick as comfortable and fun as he should. As you are pogo stick buying for your kid, you should also take into account the looks of the stick. The stick should not look bland and boring. Make sure you buy stunning pogo stick that catches attention. Kids loves vibrant and colourful graphics on sticks as well. Basically, you can ask whats your kid favourite color and see how he likes it. You should pay special attention to beginner friendly features if your kid is just starting out. Some of the include extra large base, wide foot pedals etc. These small features goes long way keeping your kid safe and happy. Small details like these adds to the overall experience. Make sure the pogo stick is smooth and does not make noise when bouncing. Your neighbours are gonna love you when you use silent pogo sticks. The weight of the stick is especially important if you plan to buy it for small children or ages around 5. Children at that age cannot carry heavy pogo stick with them. You will carry it for them. Also if possible, try to find sticks that can fit in your car. As kids tend to use pogo sticks it is crucial that the stick should be comfortable. The foam material should be of good quality. The grip should not be difficult to hold. Its always a fantastic idea to choose pogo stick made by a brand that has been an industry for reasonable amount of time. Also top brands offer a solid reliable guarantee so you are practically at no risk. With pogo sticks its usually you get what you pay. Dont worry, you dont have to buy the most expense stick in the market. Mid price range should be good enough. Just make sure that you cheap sticks at all cost and you will be good. We promise you, gifting a pogo stick is one of the best things you can give to your child. Pogo sticks combine both exercise and fun for kids in a safe manner. Pogo sticks help them get more social by going out to parks and meeting other kids. All of this experience makes your kid more confident. When they master all the tricks, kids can also make their own tricks and give then creative names. This is in turns boost their imagination and give complete creative freedom. Both of these skills are essential to excel in other areas of life as well. Yes, pogo sticks are completely safe for kids. But you should always make sure that your kids are wearing knee, elbow and helmet when bouncing in these sticks. One of the most beloved memories of my childhood is sitting and seeing my mum stitches clothes for my father. Watching her sewing for hours peaked my interest in sewing as well. Being just a child, obviously my mother couldn't allow me to use those heavy sewing machines that operate by peddling your leg was obviously too dangerous for a child. Fortunately, in today's world through the advancement of technology, we have safe and secure portable sewing machines that even a toddler can use with proper knowledge. These sewing machines are not toys and can actually be used for sewing clothes and buttons. Before we dive into the buying guide, let's take a quick look at the best sewing machines in the market. Starting off with this gem of a model made by Singer. This sewing machine is extremely easy to use which makes it a a fantastic choice for kids and small children. Not only children, this machine is perfect for beginners who have recently started taking interest in sewing. Singer start is easily one of the most popular sewing machine for kids for all the right reasons. The machine is available in 6, 19 and 23 stitch options. If your child is really young its better to choose the less stitch option to not confuse your child. The machine is lightweight and portable so that your kid can be entertained while sewing when you are traveling. The machine is built by keeping beginners in mind. There is also a simple four step button hole features that lets your kid add button holes in pillows and shirts with ease. The instruction manual that comes with the machine is very easy to follow and implement even for kids. The machine comes with 6,19 and 24 stitch option to suit your kids needs the best. You cannot go wrong when choosing this machine. It is super kid-friendly and easy to learn. The overall construction of the machine is top notch and durable. Expect the machine to last for a really long time. Perfect starter machine for anyone! Singer simple is a computerised sewing machine. It has 32 inbuilt stitches which covers all essential and most used patterns. Its perfect number of stitches for your kid to not get confused. The name of the machine describes the machine perfectly. Simple is easy to use and fun sewing machine to keep your kid happy. It is a solid high-quality sewing machine that is perfect for kids as well as beginners. The machine is portable and lightweight as well. Simple mainframe is built with heavy duty metal with good support. The carry handle on the top of the machine makes it easy to carry the machine around. The automatic threading option makes threading a piece of cake even for kid. The machine can stitch upto 750 stitches in a minute which is more than enough for your kid. The free accessories included with the machine are a pack of needles, seam ripper, thread spool Caps, Bobbins, L-Screwdriver, Darning Plate,Power Cord/Foot Control, and Soft-Sided Dust Cover. You can start sewing right after buying this machine. All the accessories provided are high quality as well which can be expected from Singer. Perfect for kids and beginners. Packed with amazing features backed by 25 year warranty is a great choice for any kid. Brother sewing machine will make your kid the coolest in the block. Filled with mind blowing features, its machine like no other. Its a plus size, compact and lightweight machine which comes with 10 built in stitches. The maximum stitching speed per minute is 750. The weight of the machine is 13 pounds which is farely easy to carry it around for kids of all ages. The button holder foot and 4 step button hole makes it easy to create the perfect size button hole for specific clothes. There is also diagrammatic presentation on the machine that shows you how to place the thread and wind it in bobby pin. Small details like these shows how much thoughts is put when making this model. Brother has been sewing industry leader for quite a some time. All of their products are top class and the same can be said about XM1010. The machine also comes with a reliable 25 year old warranty and free tech support. If you are looking for a starter machine for your kid, you should get this one without a second thought. The machine is everything you ever wanted in a sewing machine. The features like automatic threader is huge time saver especially if your kid or you plan to sew frequently. It's very smooth and silent. The price can be intimidating to some, but it's worth every penny. XM2701 is another quality sewing machine by Brother. This versatile machine is capable for various everyday projects. The machine has 27 built-in stitches that is good enough for beginners to start sewing and for experts to get more creative in their skill. As the machine weighs only 13 pounds, it makes for your kid to take it with him. While the DvD that comes with the machine is easy to follow, you are still better off just searching tutorials on youtube. The selector dial makes it simple for kids to choose and operate the machine. The led lights on the machine will allow your kid to sew at night without turning on tube light in your room. The machine will be appreciated by both experts and beginners alike. The perfect first machine to give your kid. Sparrow 25 is made my Eversewn company which is no stranger to the sewing industry. They have been known to make top notch quality machine. Sparrow 30 comes in mid-range price segment. It's a computerised machine with astonishing 310 stitch patterns. This includes 32 utility, 84 decorative & 2 full alphabets which lets your kids give maximum creative freedom when sewing. In case, you dont need that many stitches you can choose lesser model sparrow 25. Some kids are more creative than other. The machine lets your kiddo to explore his imagination without any restrictions. Often times, advanced projects need specific settings which can only be achieved after a lot of testing. Once the settings are replaced by your usual ones, its always a pain to get them every time. This is where this machine really shines. One of the stand out function of the machine is its able to memorize settings. You can basically save specific settings and use it again when needed. This saves a lot of time. This encourages kids to not loose interest and built some real quality sewing projects. Cutting the thread can be frustrating for both child and adults. This machine lets you cut the thread with a push a button. The machine also comes with a beautiful slide table that lets you sew bigger piece of cloth. The maximum sewing speed is 850 stitches per minute. Surprisingly, the machine is quite lightweight and can be carried around. Sparrow 25 is a powerful yet lightweight sewing machine that will fulfil all your your sewing needs. The memory functions is useful for projects that takes days or weeks to complete. If your kid doesn't like large sized sewing machine with lots and lots of option which he wont need. You should take a look at this cute and adorable machine. Michley LIl LSS-505 is perfectly small sized sewing machine with attractive design. If you are looking for something durable and decent quality for really small budget, then buying this machine should be a no brainer. The sewing machine is one of the few machine in this price segment that actually delivers what it promises. The instructional manual is also easy to understand and follow. Another selling point of the machine is its weight. The machine weighs only 6 pounds which makes it one of the lightest sewing machine in the market. This is huge advantage for kids who dont have sewing place and want to take their machine wherever they go. Also if you travel a lot you can take it with you as well. Other features include Led light, double thread, forward and backward sewing. Not as durable as you would like to be, but great for its price. The machine may be small compared to other machine market, but it gets the job done. This machine grows with your child as your kid gets into the advanced stage. Highly recommended for smaller children! Fastlane Fuschia is made by Janome that offers 10 stitch patterns for your kids to choose from. It a portable and compact machine that is excellent choice for kids and beginners . The stitches include all the basic and essentials like straight, zig zag and crecent with two position of needle. Many kids dont have a sewing spot at their home. As the machine weighs only 5 pounds, it makes it easy for kids to carry it all around the house. Does your kid hate the old white sewing machine? Fastlane sewing machine is available in 8 unique attractive colors to suit your kids style and choice. Looks definitely matter when choosing any product for kids. The machine does not have a Led light. This is not a big problem as you can just a small lamp for light. The machine is basic and made with beginners in mind. It's a solid choice for young entusiasts and hobbyist. Janome JW8100 is a beast. The computerised heavy duty machine can handle all project of various scales. The weight of the machine is 20 pounds which nor too heavy or nor too light for kids. Everything about this sewing machine speaks quality. From construction and design to technology used, nothing feels cheap. The machine offers an LCD screen which instructions easy to follow instructions The machine delivers 100 stitch patterns including basic and fashion, 27 Heirloom, 28 Home Décor and 7 button hole. Such variety of stitches will allow your kid to be more imaginative and boost his creativity. There is a start/stop button on side for the convince. There is a also a detachable arm which turns the machine into free arm when removed. It is great for sewing smaller projects. The machine is made up of heavy duty metal that is built to last. You can easily expect this machine for really long time without any jamming or other issues. It can be seen that the construction is clearly done well. The easy to follow diagrams are a nice touch as well. The machine is packed with professional as well as beginner level features. So you dont have to invest in a new machine after your kid reaches advance stage. Basically this machine grows with needs of your child. The high quality cover that comes with the machine keeps it dust free and clean. The machine offers end number of unique customisation to keep sewing exciting and fresh for your kid. And the convenience of the machine keeps him interested in sewing. Undoubtedly of the finest sewing machine available in the market. Final on the list is Janome Blue Couture sewing machine. Color favouritism goes a long way, especially if you are a kid. The sewing machine comes in beautiful colors that will make your kid fall in love with it on the first sight. The machines has been designed with beginners in mind. That means that not only the machine has kid-friendly features but also come with a lot of easy to follow youtube tutorials and manuals. The machine offers 15 most popular and versatile stitch patterns for kids which includes button 4 step button hole. Dont let the ‘cute’ and ‘adorable’ look fool you. This machine is made of heavy duty frame that will last long period of time. The maximum stitches per minute is 800. There is also a removable arm which makes sewing small projects easier and faster. Led Light is a nice touch. The led light should be more bright. You can fix that issue by buying a small lamp. The machine definitely delivers what it promises. It is packed convenient features that makes sewing a lot less stressful and more fun for kids. The machine provides remarkable convince for any kid who just starting out in the sewing world. No surprise here. Safety is the first thing to look for when looking for sewing machine for your kids. Even safest of sewing machine can be hurt the child. It is recommended that you supervise your child until at least a couple of times when he gets used to it. We recommend you to get a simple, lightweight sewing machine for your kid when he is starting out. Give him some and time to get used to it. After he's confident that he can handle bigger and more heavier machine safely, then you can then gift him a more advanced machine. The machine should not be complicated to use. Sewing should be fun and cool and not 'complicated' and 'hard'. Choose a machine which has convenient features to making sewing enjoyable. Try to find a machine which has kid friendly and beginner friendly features. Some of the safety features that you should pay special attention to. Finger guard keeps your kids finger safe from sewing his own fingers. You should definitely buy a finger guard in case a machine does not come with one. Let your child learn sewing in his own pace. This is not the topmost priority when choosing a sewing machine for your kiddo as their plenty of helpful youtube videos already available. But its still nice to have easy to follow instruction manual and specific function tutorials for the sewing machine. This is especially important if your are beginner and might need to check manual again and again. The main frame of the sewing machine should be made of strong metal to support sewing operations. The machine should be dependable and last long. The easiest way to avoid buying weak and fragile to make sure that machine is not buy a really cheap or non branded machine. With sewing machine, Its mostly you get what you pay for. Buying sewing machine from a brand that has been in the industry for reasonable amount of time is always a better option than buying unknown machine from a local company. Firstly, branded sewing machines comes are backed by a reliable guarantee. So incase, anything goes wrong, you will now you are in safe hands. Apart from warranty, the machine build and construction is significantly better that non branded ones. Also there are guide, extra accessories and extra features that makes it even worth spending some extra money. Incase, you are not sure, you can check reviews online and see yourself. You can go even one step further and check how to company respond to negative reviews. Since you are buying machine for kids, it is very important that you check the weight of the machine. Some kids love to sew all around the house instead of one sewing place. Having a lightweight machine allows your kid to carry it around without any problem. Also it makes it easier to take the machine with you if you plan to travel. As much as 200 stitch patterns looks great on paper, there is a little to slim chance that your kid will use even half of them especially if its your first machine. Lookout for the machine who has the most essential and useful patterns and you are good to go. For the most part, With sewing machine its mostly you get what you pay for. But at the same time, when you are just are introducing the kid to the sewing machine you might not need an expensive solution. Set a budget for the machine, and see what suits your kids need the best. Watching your kids sew is one of the most satisfying things for parents. Making new designs not only boost their creativity but also help them concentrate from a younger age. Sewing and stitching their own buttons and clothes also teach them about responsibility. Sewing also lets kid be more creative and imaginative which also helps them in future in other fields of life. Longboarding is one of the most fun and enjoyable experience your kids can have which will they will stay in their memory forever. One of my best memories comes from riding scooter that my mom gifted me when I was around 8. It's one of those beautiful memories that are still fresh, and hold a special place in my life. You can can give something the similar to your kids when you get them a longboard. Due to the recent hike in popularity, the amount of longboard manufacturers have increased dramatically. Finding the right board that not only is safe but also suits your needs well can be time consuming and daunting task. Without wasting time, let's dive into some high quality boards in the market. 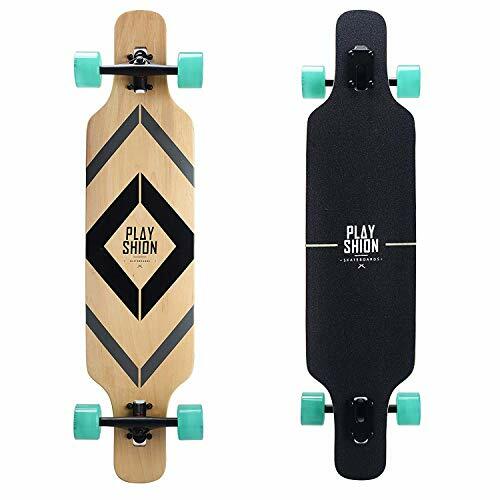 Plyfashion is a fantastic longboard which is made of top notch quality material. This board is designed for kids who are have just started out exploring longboarding and are still in beginner stage. It is basically a multi function board capable of cruising, sliding, curving, downhill, free ride and freestyle and pretty much everything longboards are made for. The concave shape deck of the board keeps your kids feet stable and avoids misbalance due to wrong footing. It also allows your kid to have more control while taking turns, sliding etc. Different kids have different style of ridding. The board allows you to either tighten or loosen the kingpin. Loosen trucks are better for tricks and stunts and tighten trucks are better for high speed stability. The kid can choose as per his needs at the time. The ground clearance is over 4 inches which ensure perfect balance for beginners. The ball bearings used in the board is made of high quality bearing steel which is harder and durable than carbon steel. This allows the rider to enjoy a smooth and silent ride. When purchasing, the board comes in wide variety of colors to suit your kids style. The weight limit of the board is 200-250 lbs. Makes no noise when in use. 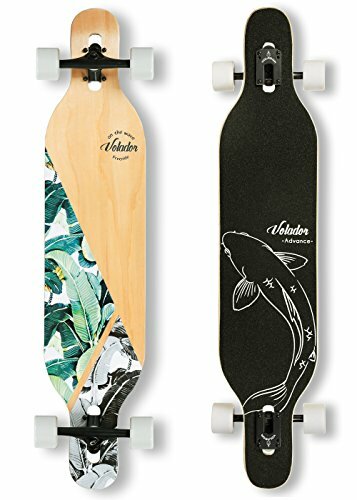 Voldor Longboard is packed with amazing features. The 42 inch long board has more than space to keep your child foothold secure and stable. It can be seen, that the construction is solid and well built. With 8-hard maple, the board is sturdy and durable as a longboard can get. You can easily expect your kid get bored or sick of longboards before this board can break. The shape of the board is unique and will make your stand out from his peers. The shape is symmetrical and is designed in a way that avoids wheel-bite from any angle. You can have peace of mind knowing that your kid wont fall on any extreme turn and will enjoy amazing manoeuvrability. 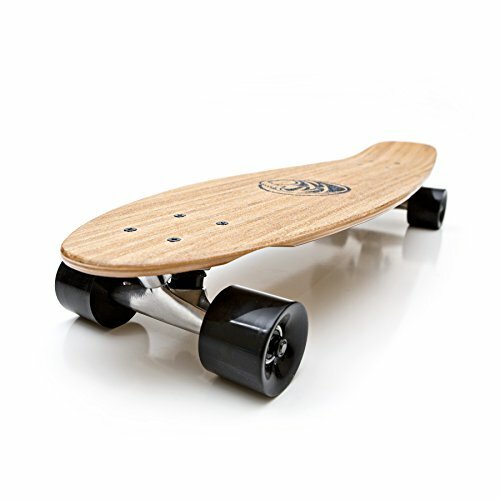 The longboard is forged by top notch quality material like genuine aluminium alloy trucks, carbon steel bolts, chrome steel bearings, high rebound PU wheels. So you know your kid is in safe hands and not some shaky board. The boards are designed to look cool as your kid. Unlike other longboard designs, the bottom graphic is durable and will not fade away. The inspiration of design has been taken from various culture. You can basically found a design for almost boys, girls, kids etc. With vibrant graphics and durable deck, this is one board you should get your kids right away. The turn radius is pretty good, you can hit sidewalks without needing to pickup the board and adjust. The board is very comfortable while ridding, you can pass through rocks, grease and other rocks smoothly. The graphics are beautiful and vibrant which makes you stand out. Multiple layers of Bamboo and Canadian Maple with durable heat transferred graphics and clear grip tape. 5 inch aluminum trucks with polished finish and ultra high rebound bushings. 60mm x 45mm high rebound urethane wheels. Abec 9 Hellion 2 bearings with built in spacers. Ride with style with this beautiful longboard. The 40 inch high quality longboard is something every kid needs. The board comes in wide variety of colours to suit your kid attire and style. The classic old school design will definitely make your kid a rockstar among his friends. With a lot of beginner friendly features, the board is just right for people and kids who have recently started taking interest in riding. The deck of the board is made from material that is combination of Canadian Maple and Bamboo which makes it super strong and durable. The simple yet unique small graphic on top and bottom of the deck is elegant and compliments to overall classic look. The board also offers a small kick tail behind which tricksters are gonna love. If your kid is more adventurous type then you should get this board without a second thought. The construction and design is well built as well. Classic and unique design that makes you stand out. The bearings that come with board are not of the best quality. You might have to replace them sooner than expected. 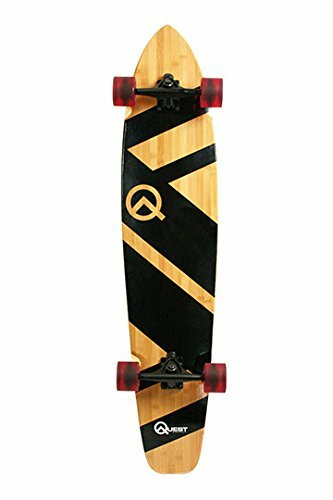 Quest super cruise longboard provides the best bang for the buck. The construction quality and built they provide can rarely be found in this price segment. The picture does not justify how beautiful the board looks. You can expect to get a lot of attention from your fellow riders and general public when you take this board for a spin. Technically, this board is a marvel. The deck of the board is comfortable and lets you easily make turns. The abec bearings keeps the ride smooth and noise free. If you do not plan to invest a lot of money, this board is the one you should consider. Anfan Longboard is the most complete longboard your kids will ever need. The cruiser shaped board comes in three different colours for your kids to choose(Purple, Black, Blue) from. The weight of capacity of the board is over 220 lbs which is more than enough for any kid and almost all adults. The material used is high density 9 layer Canadian maple which is best quality you can get. The anti shock wheels absorb all the shock from hitting cracks and gaps on roads. The anti shock wheels also allows the board to ride over cracks and gaps without shaking or loosing balance. Your neighbours are gonna love your kid as the board makes no noise when riding. The board is great making extreme turns when necessary. You dont need to pick up and adjust when wanting to turn on corners. The board is portable and you can easily fit it in your back pack and take it to skate parks and schools. Apart from above features, the biggest selling point of the board is its pricing. Other boards in the pricing range do not even come close to this board in terms of features and build quality. No doubt, one of the most affordable longboards in the market. If you are on a tight budget and yet want to enjoy boarding, buying this board should be a no brainer. A solid choice for kids and beginners. This is the most important factor that we consider while evaluating longboard. Longboard just by their nature are very much safer and reliable than skateboard and other riding vehicles for kids and beginners. Almost all longboard are stable and provide good control even at high speed. The deck are longer and wider, that gives enough space for the kid to comfortably position their foot. Even though longboard are extremely safe , it is still very important that your kids to wear helmet, knee and elbow pads whenever they go out for riding. Even though longboards on the list do not cost a lot, we still want to last for a long time. The decals and graphic on the board should also not fade after a while. The structure and design should be solid and well built. The bearings should be of atleast decent so that ride is smooth and silent. Best thing about longboard, there is one for everyone needs. Instead of overthinking and getting confused with a sea of options choose one that suit your needs the best and get started with it. After reading this detailed guide, You are armed with more than knowledge to buy a great board for your kid or even yourself. Help other people know by sharing this guide. Whats difference between penny boards and longboard? In short, penny boards are type of skateboards which size ranges from 22 inches to 27 inches while longboard ranges from 34 inches to 50 inches approximately. If you want to know in detail we have a whole post about it here.